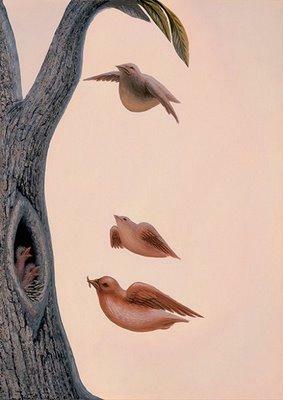 This beautiful and gentle picture called "Family of Birds" is the work of Octavio Ocampo who is a well known artist from Mexico. In this image you can see some birds hovering around the bark of a tree, while inside the tree are two chicks with their mouths open waiting to be fed. If you look again however the image also becomes the face of a young lady. When I first saw it it looked like a ladys face. Lol I didn't even recognise the birds!